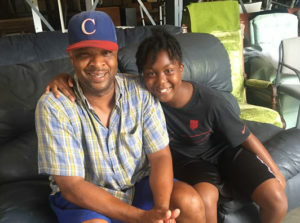 Darnell and his 13-year-old daughter, Haile, lived out of a car for several months after Darnell got injured working on the I-4 Ultimate Improvement Project. Heat produced from a welding arc and spark damaged Darnell’s eyes rendering him legally blind. He could no longer work or pay his rent so his landlord evicted him. Darnell, who served five years in the Army, said it took him several months to navigate and get help from homeless organizations, so he and his daughter ended up living in his car. They took showers at the YMCA and received some support from friends who also were struggling. Though homeless, Haile still attended school. Darnell is now receiving disability benefits. He said he needs at least six eye surgeries and can’t afford medical care. He said Supportive Services for Veterans Families (SSVF) got him and Haile off the street and is helping with rental assistance. SSVF referred Darnell to The Mustard Seed for basic furnishings for his new home.